Grilling is an ideal way to cook fish, producing quick, easy and delicious results. In most cases, you can watch it happening before your eyes, and pop it onto a (warmed) plate the instant it is cooked to perfection. As pretty much any fish of a suitable size can be grilled, these guidelines should help you whatever your choice. 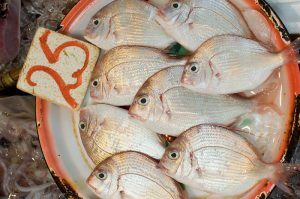 As there are far too many species to consider for this short article, your main choices can be broken down into flat fish, round fish, and oily fish. Then you can chose to have the fish filleted or cooked on the bone. Large fish can, of course, be cut into suitable sized portions, again on or off the bone. If there is a secret to successful fish cookery, it is to cook the fish for as little time as possible. Fish needs to be heated through just until the point the flesh has “set”; cook any further and you lose moistness and flavor. We are usually talking just minutes here. Some fish need scaling, and some need to have the skin removed before cooking. If you are not sure, ask your fishmonger, and they will prepare it for you. Even if the skin is inedible it is often better to leave it on while cooking, after which is will easily peel off, or you can just eat the fish from it and leave it on the plate. If you are cooking whole round fish, such as herring, bass, trout etc, cut a few diagonal slashes in the flesh, right down to the bone, just before cooking. This helps the heat penetrate so that the fish can cook evenly. The final consideration before you begin cooking is simply how thick is your fish? A thin fillet of sole will obviously cook much more quickly than a thick tuna or cod steak, for example. The basic rule is the thicker the fish, the lower the heat, or the further away from the grill. If it needs it, oil the fish, not the pan or grill. Season liberally with good salt and freshly ground black pepper, and by all means rub in some chopped herbs if you like them. Pre-heat the grill before you start to cook – wait until it is at the full required operating temperature. If cooking filleted fish, place the skin-side toward the heat first (unless, of course, you have had the fish skinned). Indicators that the fish is ready are when the skin starts to slightly char and become golden, or the flesh becomes opaque rather than translucent at the thickest part, or that the flesh can be easily pulled from the bone. Turn, if necessary to finish the other side – it will generally not take as long as the first side. Fish, when grilled simply, is so delicious that it rarely needs elaborate or fancy sauces – often just a little melted butter or a squeeze of lemon is the perfect finish.